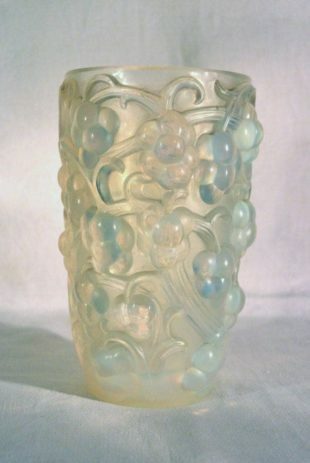 Rene Lalique (1860-1945) started as a designer of jewelry in Paris. In 1890 he was one of the moist important designers of jewelry in the style of the Art Nouveau. Later on he started to develop objects of glass. His designs of glass were more in the style of the Art Deco: clear and transparent glass with firm lines – complete different than the pate-de-verre designs of the glass factory Daum. The glass of Lalique is not blown free, but pressed in a form and also a great difference with the glass objects of the art nouveau is: there are no landscape sceneries anymore. With the factory of Lalique in Wingen-sur-Moder worked in the years of 30 more than 600 workers. After his dead in 1945 his son Marc Lalique started the production of glass again. The forms were still there and were also not destroyed in World War II. So he could start easily with producing glass. 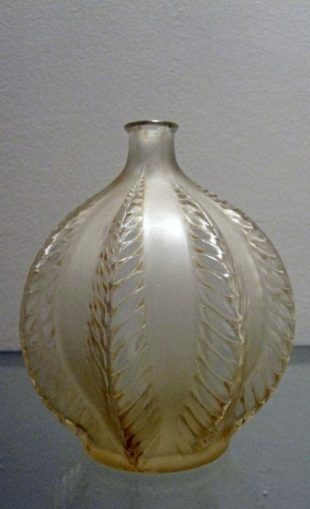 And nowadays the original forms of his father Rene Lalique from the years of 20 are still used for making glass nowadays. There is only a great difference between the originals and the copies from nowadays: notice the color very good when you see a piece of Lalique. The composition of the glass makes a great difference: there is another percentage of lead in the glass. And that is what you can see and feel when you have the piece in your hand. Further on there is a difference in signature: The objects of pre World War II are signed with R. Lalique in different characters but always with the R. of Rene. Watch for forgeries. It is easy to scribe the character R by the name of Lalique.